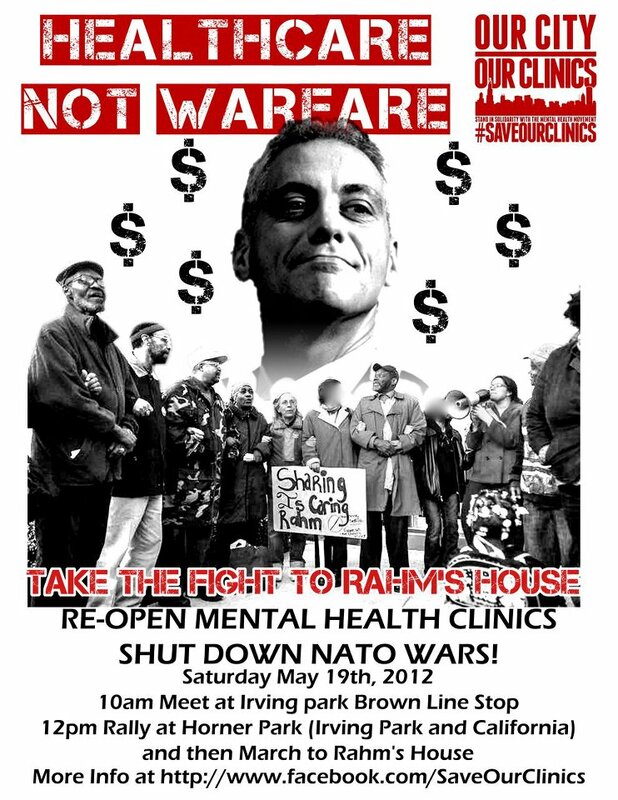 The Mental Health Movement is calling on all NATO protesters to occupy the public clinics being closed by Mayor 1% Emanuel. On May 19, NATO demonstrators will take the fight to #SaveOurClinics to the Mayor's doorstep. At 10am, masses of demonstrators will gather at the Irving Park Brown Line stop, where they will be given hospital gowns with "Healthcare Not Warfare," and, "Clinics Not NATO," written on them. They will go door to door, asking Rahm's neighbors where they can find mental health care, since they Mayor has closed the clinics that serve our communities. At 12pm, the Mental Health Movement and supporters will converge on Horner Park at Irving and California, and will then march on Rahm Emanuel's house at 4228 N Hermitage.